The recently completed 3rd Street and Highway 3 project, also known as the Horseshoe Parking Lot Screening, is a sign of bigger things to come. The proposed 5th and Water Street Reconstruction Project could be ten times as large. 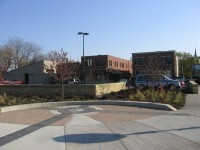 Both projects are just more recent examples of the on-going Streetscape Plan, work financed by residuals generated by the Downtown TIF District. According to state law, money generated in the district must be spent in the district. The City worked with a variety of consultants and gathered input from local stakeholders in a year-long process to develop an overall plan for this substantial program. Learn more about the 5th and Water Street Reconstruction Project and future Streetscape Plans at the upcoming Forum.